Submitted by Alexander Briones on May. 31, 2018. Originally published on Mar. 22, 2016 and last updated on May 31, 2018. 61-Key MIDI keyboard controllers balance portability and functionality nicely, having enough keys for complex two hand playing, while retaining a portable profile compact enough for portable use and for small studios. 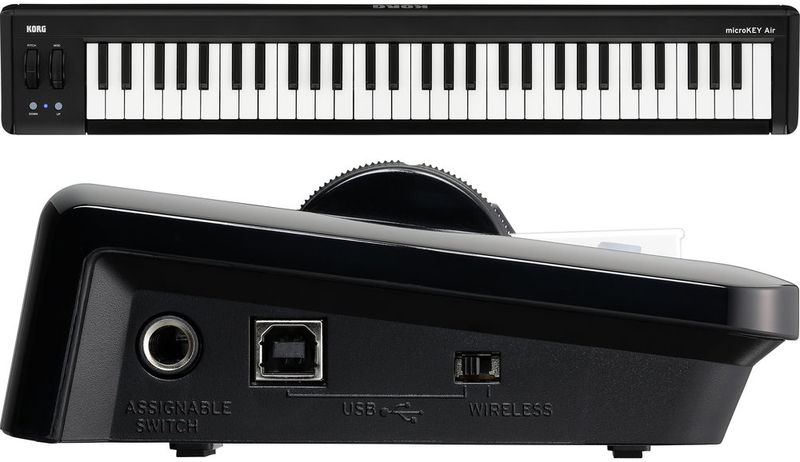 This makes them ideal mobile controller for keyboardists and pianists, be it for recording, music production or for live performances. Here we look at current market favorites, updated for 2018, categorized by price range. The Nektar Panorama P6 is a MIDI keyboard controller that covers all bases, and does so effectively. With 93 real-time controls, you'll find it hard to run out of things to do, and all of this is provided for without compromising the quality of the keys and its overall build. With its combination of traditional feeling keys and modern control features, this MIDI keyboard is designed to cater to a wider audience. Pianists will be more than happy with the Panorama P6's weighted piano style keys that are true to the shape and feel of acoustic pianos. On the other hand keyboardists and electronic musicians will appreciate the wealth of controls available, especially the pads and faders. It's nice display monitor is also noteworthy, providing excellent visual queues that complement both live performance and studio recording work. The Nektar Panorama P6 continues to gather positive reviews and ratings, with its build quality and playing feel as its best traits. Reports are consistent in saying that it integrates really well with their software of choice, with Cubase and Reason getting the top mentions. Interestingly, instead of complaining about its relatively high price, there are some who praise it for its value for money. There are some keyboardists who complain about the action difference between the white and black keys, but it may very well be due to their muscle memory being used to a different playing feel. This is an excellent feature packed MIDI keyboard controller for anyone who wants more control and musical expression. Well worth its price tag considering its easy software integration and control capabilities. Drawing from their experience as a developer of virtual instruments, Native Instruments designed the Komplete Kontrol S61 MK2 to make it as intuitive and versatile as possible. And to do just that, they employed two full-color displays into the unit, along with complementary knobs and buttons that can be auto-mapped or custom assigned as you please. As expected, it integrates nicely with their own Komplete 11 Select software, which is bundled with the keyboard. Note that the S61 MK2 does not come with pads, but it does come with a semi-weighted 61-key Fatar keybed with aftertouch. The Native Instruments Komplete Kontrol S61 MK2 continues to rake in high ratings with its keyboard feel, good software integration and portability. Even those who have qualms about compatibility issues with other software still commend its playability. There are also a good number of users who are happy with the bundled Komplete software, both in terms of ease of use and sound. Its intuitive design and portability also come up often in reviews. While it does integrate nicely with many popular software applications, there are still some complaints from those who are using non-compatible software. With its bundled software and good integration, the NI Komplete Kontrol S61 MK2 MIDI controller can technically be considered as a true instrument, making it a great buy for many. The A-800PRO follows Roland's tried and tested formula of combining technology, quality and reliability in a package that is priced just right to appeal. It comes packed with features for its price, with 45 assignable controls that include sliders, knobs, transport, buttons and more. But its more than just a numbers game because its main feature is still the quality of its velocity sensitive keys and pads. In addition to its wealth of controls, Roland also designed the A-800PRO to be easy to use, with convenient software integration. Finally, this MIDI Keyboard is surprisingly light compared to other 61-key controllers, especially when considering the many things that it can do. The Roland A-800PRO has a long list of commendable traits, from its soft touch synth-action keys, to its easy software integration, along with its iOS compatibility and portability. The 61-key synth-action keybed gets the most positive mentions, with plenty of reports which say that it is easy and inspiring to play, especially for non-piano players. It is popularly used with Sonar, but it works just as well with other mainstream DAWs like Reason, Ableton Live and more. Piano players who prefer weighted keys will have to look elsewhere, because this one is as synth as it gets. Some users expressed concern on the unit's durability because of its mostly plastic components, but this is the price to pay if you want a portable lightweight 61-key controller. There are some experienced users who complained about deep editing problems, thankfully all of these are workable and may not effect its other functions. If you want a reliable and portable MIDI controller, then the Roland A-800PRO is your best bet. With its big name backing and good user ratings, this is well worth taking a close look at. Having been made by Akai Professional, the company that pioneered the use of pads as controllers, it's no surprise that the MPK261's most notable feature is its expressive pads. But its not just about that because it also features 61 semi-weighted synth style keys, a combination that caters to modern music styles. Guaranteed iOS compatibility is also a plus for added versatility. *You need the optional power adapter if you want to connect to devices using the 5-pin MIDI port because it can't use USB Bus power in this configuration. Satisfied and impressed users continue to rate the Akai Professional MPK261 highly, and in this market where keyboards are normally rated poorly, getting this much acclaim is quite an accomplishment in itself. As expected, the pads get a lot of thumbs up. To Akai Professional's credit, even the synth action keys are well received, with many reviews noting how much of a dramatic improvement they are compared to others in the market. Software integration is something that the company should definitely improve on, because majority of the complaints on the product (which are few nonetheless) are pointing towards inconvenience when it comes to integration. Logic Pro X in particular got special mention, with users saying that the keyboard does not integrate well with this DAW. Also worth noting is the lack of power options other than being USB bus powered. 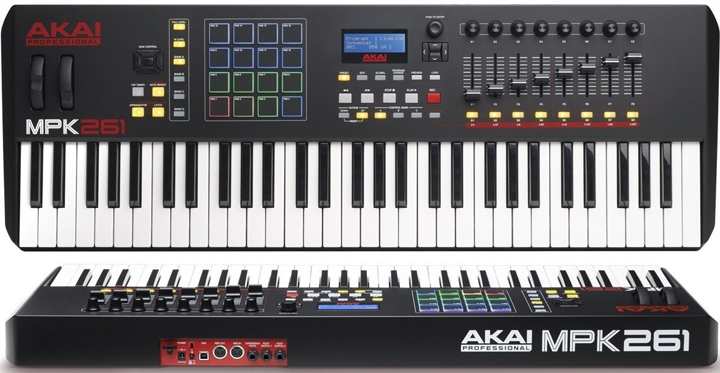 With its sleek appeal, extensive control set and reasonable price tag, the Akai Professional MPK261 is highly recommended. If you're not sure what to get and you have the budget for it, this is the safest pick. Korg is known for pushing the boundaries when it comes to music gear technology, and the microKEY AIR-61 is an excellent example. This MIDI keyboard offers true wireless operation with its built-in Bluetooth connectivity, allowing you to control your software instruments without having to plug-in any cables. It is an ideal match for the iPad and Laptops, great for mobile recording and for capturing ideas while on the go. Running on a pair of AA batteries, the microKEY AIR-61 gives you up to 30 hours of wireless use, much more than the operating times of most laptops and mobile devices. In addition, it can also work as a regular MIDI Keyboard by removing the battery and connecting it via USB, which also powers the unit. Since it is meant for portability, it is stripped down to just the keybed, a pitch wheel, a mod wheel, and octave buttons. As the label implies, it has 61 mini-keys with Korg's natural touch feel, their version of synth action which many users prefer. Many of the positive reviews for the Korg microKEY AIR-61 are from iPad and iPhone users. They reported that it works really well while wirelessly connected, with very minimal latency. The feel of the keys also got a lot of commendations, even from non-keyboard musicians. Most of the complaints center on the smaller sized mini-keys, which require technique adjustments if you are used to playing regular size pianos and keyboards. There were however others that loved the smaller size, especially since it makes for a compact partner instrument for their mobile device. Some users also cautioned that the bundled software are outdated and can be annoying to install/un-install, they recommend that you just use your existing DAW. If you are always on the go, or you just want a keyboard that works wirelessly, then get the MicroKEY AIR-61. M-Audio has a knack for producing music gear with good features at modest price points, case in point is the Oxygen 61 MKIV with its full-size synth-action keys that rival those from more expensive units. Complementing the keys are controls that include 8 velocity-sensitive pads, 8 assignable knobs, and 9 faders. The automap functionality with industry standard DAWs like ProTools, Logic, Reason, Cubase and more also makes first time experience with this unit even more pleasing. And it also helps that the Oxygen 61 MKIV looks sleek and uncluttered, reducing distractions so you can be more productive. There are no standout complaints other than a few who are looking for heavy piano action keys, and others who wanted more features, like color-lit pads and more buttons. If you are looking for a reasonably priced good value 61-Key MIDI Keyboard then do check out the M-Audio Oxygen 61 MKIV. Behringer is known for the incredible value that their products bring, and this is exemplified by the MOTÖR 61. For the price, you are getting a full featured MIDI keyboard controller complete with velocity-sensitive pads, transport controls, encoders, and buttons - but what sets it apart is its motorized faders, something that's normally only seen on expensive keyboards and mixers. As for the keys, Behringer equipped it with 61 semi-weighted synth-action keys that are velocity sensitive and feature aftertouch. Value for money is easily the best feature of the Behringer MOTÖR 61, and this is reflected in reviews. With its many features, it is not surprising to find many reviewers impressed with its versatility. Its full spread of controls make it ideal for music production, especially with its motorized faders. Surprisingly, there are also some who are happy with its build quality, a testament to Behringer's improving production processes. There are a few who are not too happy with the bundled software, while some are not impressed with the feel of the keys. The Behringer MOTÖR 61 is a great value 61-Key MIDI keyboard controller that can be a great addition to any musician or producer's gear. The MK2's most notable update is improved compatibility with Ableton Live, further establishing the Launchkey series as the MIDI Keyboard Controller to get for said DAW. Hardware improvements were also implemented, including reliability improvements for the knobs and pads, as well as the addition of RGB color-matching feature to its 16 velocity sensitive pads. It retains its 61-key velocity sensitive synth style keys and its class compliant design. Note that with its extra features, the iPad can no longer power the Launchkey 61 MK2, using a powered USB hub can be a good workaround. The Noavation Launchkey 61 MK2's upgraded color-lit pads continue to impress users and experts alike, while its synth action keys receive plenty of commendations. Some users even compare the keys to more expensive keyboards like the Ultranova, SH-101, DX-7 and more. Convenient Ableton Live integration is also one of its strong points, but there are some users who find that it works just as well with other DAW software, including ones that are not meant for live performance like Pro Tools. There were a few non-Ableton Live users who could not make full use of its features, but this is to be expected. One valid concern however is the use of plastic parts which translates to reduced durability and reliability. But it is still respectably durable, and only requires reasonable care in handling and storage. The Novation Launchkey 61 MK2 is a pretty good and reasonably priced keyboard controller, especially if you are using or planning to use Ableton Live. Alesis continues its legacy of providing quality yet affordable equipment, as seen in their entry into this list, the Alesis VI61. It's major highlight is the medium tension piano-style keys with aftertouch that it comes equipped with. And it's not just about the keys, because the Alesis VI61comes packed with features, with a staggering number of buttons to boot! For the price, this MIDI keyboard comes with 16 full-color RGB backlit drum pads for controlling software drums and percussion instruments. It also features 6 transport controls, nine sliders and eight knobs, all of which allow for in-depth control of your sound parameters and your DAW, right at the controller. With the Alesis VI61, you're getting more than what you're paying for, and this is a sentiment shared by many of its users. Reviewers describe the keys in positive light, saying that they respond really well to playing, and can compete with more expensive keyboard controllers. The same can also be said with its 16 pads, which many electronic musicians appreciate. It's not all sunshine and rainbows though, because there are concerns about the great feeling keys sometimes producing a squeaking friction sound. An experienced user provided a workaround that involved carefully lubing one of the supports for each key and that solved the issue for him. Still, this is not a universal issue so not much of a deal breaker. Another common concern is its lackluster software integration, it requires some legwork to get it to mapped to some DAW software. This lightweight and affordable MIDI Keyboard controller has satisfied many users, and as such comes highly recommended. If you're looking for an affordable piano-style keyboard then you should consider getting the Alesis VI61. 83 out of 100. Incorporating 90+ ratings and reviews. The Nektar Impact GX61 is a compact 61 key midi controller that provides essential functionality at a very good price point. It doesn't have much in the way of bells and whistles, but it does provide what you'd expect in the price range, full keyboard functionality with a bit of extras thrown in. At its core is its synth-action keybed with 61 full-size velocity sensitive keys, so the keys are expected to be light and easy to use. Note that this soft playing feel may throw off users who prefer piano like action, but it is unreasonable to expect premium feel in this price range. Other features of the Impact GX61 include 7 MIDI assignable buttons, an assignable potentiometer knob, and dedicated controls for octave switching and transpose. It is designed to conveniently pair with popular DAWs, including Cubase, Reason, Nuendo, Garageband, Sonar, Logic, Bitwig, Reaper, Studio One and FL Studio. Finally, Nektar was able to pack all these features in without compromising portability with its small profile and light weight. Even those who are critical of the MIDI controller find themselves pleasantly surprised with the overall quality of the Nektar Impact GX61 after taking it out of the box. Many commend its weight and portable size to be just right for mobile use, while others are impressed with how easy it is to setup. Interestingly, many of the users who give it high ratings are guitarists/bassists who want a compact piano in their home studio. There were a few who found the action to be too light and wished for the same keyboard to have a model with semi-weighted keys. There are a few who want traditional 5-pin MIDI connectivity - you'll have to chose another keyboard if you want this option. All in all, if you prefer the lighter feel of synth action keys, and you don't need 5-pin MIDI, then the Nektar Impact GX61 should be high up in your list. 80 out of 100. Incorporating 90+ ratings and reviews. The Samson Carbon 61 is as streamlined as it gets, with minimal controls, focusing only on what's important in the entry level price range, which is the keybed. This reduces clutter and moveable parts, resulting in a more compact and lighter controller that gets the job done. The 61-key keybed is semi-weighted, which gives it a synth style action that many prefer. The keys are velocity sensitive, allowing for expressive playing. Another nifty feature of the Samson Carbon 61 is its integrated iPad stand, which makes it an ideal companion for your iOS tablet. Most of the positive reviews are from users who paired the controller with their iPad, which goes to show that it is doing well for that purpose. Others are happy with the feel of the keys and its portability. There are a few users who report using the keyboard for many years without any hiccups. There are some who are not happy with the keybed's velocity settings, while others were hoping for a few more control options. All in all, the Samson Carbon 61 is a nice MIDI keyboard controller for those who want something affordable and easy to use. Most keyboard controllers come with semi-weighted synth action keys, and the reason is simple, they provide a good balance of playability, dynamics and portability which many prefer. There are some 61-key controllers that come with weighted and full-size keys that cater to pianists, just keep in mind that these are often heavier, bulkier and more expensive. Velocity sensitive keys measures the speed of the keys as you press them, allowing for more accurate and detailed control over the sound. Because of the expressive control it provides, it is now a standard feature for most MIDI keyboards. Some even offer multiple velocity curves to choose from, allowing you to personalize the feel of the keys. On the other hand, Aftertouch detects pressure applied to keys while they are held down, this data is then converted into MIDI for controlling vibrato, volume and other parameters. Since it requires more mechanical components, expect to pay a bit more for keyboards with Aftertourch. The more control options a keyboard have, the more control you can have over your instrument and your DAW software. The downside is that they can be distracting, and they may take more time to setup, and not to mention they help jack up the price. For example, having motorized knobs and faders is definitely an advantage, and not to mention cool, but it's a feature that you'll have to invest a considerable amount of money in. Check out the Nektar Panorama P6 if you're looking for this feature. Having dedicated buttons to control your DAW on your keyboard is convenient. Being able to play, rewind, fast forward, stop and more right on your keyboard will save you the hassle of moving back to your computer, and more importantly - help you avoid disrupting your train of thought and inspiration. USB MIDI keyboard controllers are primarily designed for use with Mac or Windows computers. For this reason, the USB port has become its standard connection. These days, most USB keyboards are class compliant, utilizing basic USB drivers to work on different operating systems. This means that they can work with iOS devices like the latest iPad and iPhone. If you're looking for a controller that can also work with standalone synths and other non-USB external hardware, you'll want to look for ones with 5-pin MIDI connection. While manually configuring your keyboard controller allows for better personalization, that can be very time consuming if not downright frustrating, especially for beginners. As such, we recommend going for those that can automatically configure themselves via auto-mapping, which reduces setup time and allows for plug and play functionality. Obviously, having auto-mapping for every DAW is next to impossible, but you will want one that works with your preferred software. Note that some manufacturers provide instructions, or better yet, a download link for quick installation and auto-mapping with many of the popular DAWs. It's impressive how these bigger 61-Key MIDI keyboards can still be bus powered, but it would be better if the keyboard offers multiple power options like the ability to be plugged to a power outlet or run on batteries. The more options you have, the easier it is to adapt to various stage and studio scenarios. Note that the iPad's USB port provides lower power levels, which may not be enough to power more complex MIDI keyboards. We looked at all available 61-key MIDI keyboard controllers in the sub $1000 price range, which is not that many, so we ended having most of them analyzed, with a total of 20 61-key MIDI keyboards in our database. For this update, we re-compiled relevant data for each one (over 1,600 sources in total), including the most current customer feedback, expert reviews, discussion forum posts, and many others. The gathered data were then processed through Gearank’s rating algorithm, which gave us the scores that we use to rank each one and get what the market considers as the best among them. Finally, we divided the list into price categories for convenient navigation. For more information about this process see How Gearank Works. Submitted by ehsan (not verified) on Oct. 2, 2016. Does the lAUNCH KEY 61 have Aftertouch? Submitted by Jason Horton on Oct. 2, 2016. We mistakenly reported the Novation Launchkey 61 as having aftertouch keys but it does not. I have corrected the error above. Submitted by Charlice (not verified) on Nov. 7, 2016. Would you recommend a beginner to begin with a 61-key controller? Submitted by Jason Horton on Dec. 7, 2016. Yes. The main thing for a beginner is if it has all the controls, buttons and knobs you need to control your DAW or plugins. 61-key controllers typically have more of those than smaller options. Submitted by NSPanicker (not verified) on Dec. 15, 2016. Does Novation Launchkey 61 have Full size keys? Submitted by Jason Horton on Dec. 15, 2016. Novation hasn't specified it exactly, but based on the length of the keyboard I'd say tentatively yes. I'll post back if I can get more specific information. Submitted by Jason Horton on Jan. 20, 2017. I've sent another request to Novation, hopefully we'll have an answer soon. Submitted by Jason Horton on Jan. 30, 2017. "The Launchkey range features a synth-style keyboard with the key depth/size being full size". I've updated the details above to make clear that the keys are full size. Submitted by siddhesh (not verified) on Jan. 20, 2017. What about Arturia 61 key lab???? Our Gear Database is available to help you answer questions like this because it lets you look up an individual piece of gear or create lists of gear to compare. I made a list of all the 61-key MIDI controllers in our database and sorted them by Gearank from highest to lowest rated - you can view the list here. With a Gearank score of only 69 the Arturia KeyLab 61 is currently the 2nd lowest rated option in our database and as a result we haven't recommended it in this guide. Submitted by Lisa P (not verified) on Feb. 20, 2017. I read all the reviews and you consistently left out the part if they have a built in arpeggiator. Do you know how hard it is to find a 61 key weighted midi controller with a built in arpeggiator that can sync to incoming midi clock and has editable patterns? Why doesn't someone make that? Closest and only one to be found is the Novation Impluse 61, but it's keys are only semi-weighted, and barely at that. Thank you very much for your feedback Lisa. Arpeggiators that sync to MIDI aren't always included in manufacturers' specifications, however we will pay closer attention to this when we next update this guide and will try to include that information for as many keyboards as possible. Submitted by joe (not verified) on Jul. 23, 2018.
if you're buying a MIDI controller, why would you need a "built in" arpeggiator? there are tons of plugins that you can use. that's probably why you aren't seeing it on MIDI controllers. Submitted by John Hoopes (not verified) on Jul. 6, 2017. Has anyone used two or more of these stacked to run Hauptwerk virtual organs? If so, which one and how did it feel to play tracker organs vs other organs? how do we know which do or don't have full-sized keys? can we assume if it doesn't specifically say so that they aren't? it says "The 61-key keybed is semi-weighted, which gives it a synth style action..." which is it? semi-weighted and synth action are 2 diff things. Submitted by Nemanja (not verified) on Feb. 4, 2019. What about Acorn Masterkey 61? It's a marvelous midi keyboard, synth-sized keys, and it's about 100 USD. It didn't quite have high enough ratings for us to recommend it when we published the current version of this guide. However, I've just updated our ratings for it and it's very close - it would have a good chance of making the recommended list above if we updated today and is currently on our short-list for consideration when we next update this guide. Submitted by Jake (not verified) on Apr. 21, 2019. Quick question, the MAudio Code is pretty dope, was it considered for this list? Submitted by Jason Horton on Apr. 23, 2019. Yes the M-Audio Code 61 was considered but didn't have high enough ratings for us to include it in the recommended list above - you can see its ratings here.